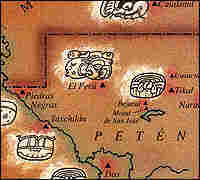 A map showing the location of the ancient Mayan city El Peru-Waka, which means "centipede place with water in it." U.S. federal agents report that the looting of the world's archaeological sites is epidemic. One archaeologist working in Guatemala has launched a battle to save an ancient city from the ravages of looters. The rules have changed for museums, dealers, collectors and auction houses. Looted relics have become as contentious as they are beautiful. In Part Two of this report, we examine the tomb robbers' global marketplace. This 8-foot-tall carved limestone monument, or stela, depicts the Mayan king K'inich B'ahlam II, or Sun-Faced Jaguar, carrying out a ceremony in Waka, in A.D. 692. The carved surface of the stela was sawed off in the late 1960s, removed from Guatemala and sold. Today, it is in Fort Worth's Kimbell Art Museum. At the famed Kimbell Art Museum in Fort Worth, Texas, you can sit in the cafe, have a slice of basil pesto quiche, and gaze up at stunning evidence of the looting of the ancient world. The dining room is dominated by an 8-foot-tall carved limestone monument, or stela, of a Mayan king. "He's shown in all his regalia, with an elaborate headdress, various ornaments hanging from his belt and jade belt pendants," says Timothy Potts, the Oxford-educated director of the Kimbell. "It's so rich. It's so lively. It's a tapestry; every square inch is covered with something." Despite his obvious admiration for the stela, Potts says that it was likely looted from its original site in the 1960s, taken out of Guatemala and sold. 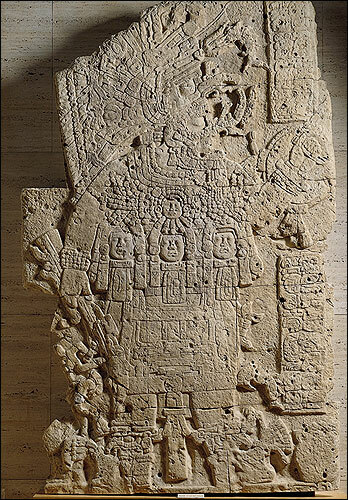 So how did this stela get from the jungles of Central America to a Forth Worth art museum? In Guatemala's Peten Province, not far from the Mexican border, is the archaeological site of the Mayan city El Peru-Waka, which means literally "centipede place with water in it." The city of about 4,000 people flourished between 100 B.C. and A.D. 800, with plazas and pyramids and orchards. It was ruled by the dynasty of the Centipede Kings. Now, all that's left of the limestone structures are great mounds covered with vegetation. In the trees, militias of howler monkeys defend their real estate. Dr. David Freidel, a Mayan archaeologist at Southern Methodist University, has been trying to protect this site. For five years, Freidel has been coming to El Peru-Waka, trying to decipher the hieroglyphics that tell us who the ruler-priests were, who their queens and enemies were, how they worshipped, and why they fell. "When looters dig into mounds, they destroy history," Freidel says. "When you lose that history, you often cannot replace it." 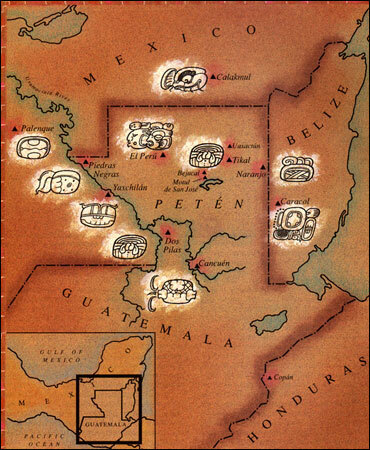 Looters generally look for tombs, five of which have been found at Waka by Freidel and his Guatemalan colleague, archaeologist Hector Escobedo. Three of the burial chambers are royal — filled with beautiful painted ceramics, and objects of jade, obsidian and onyx. Word has gotten out about the tombs' treasures, and Freidel has had to hire his own guards. "Despair and poverty drive the system," Freidel says. "Everybody's on survival mode. If I left, they would definitely loot it to pieces." He is fortunate to share his camp with a garrison of Guatemalan soldiers. The army moved in because of the cocaine traffickers active in the area; they appreciate the Petén's isolation and proximity to Mexico. Drug smugglers are also moving antiquities. Last June, police raided a house in the area and discovered a large amount of marijuana along with 135 pieces of Mayan pottery. Walking through the underbrush, it appears the scavengers have been everywhere. 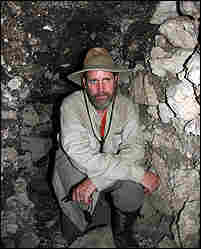 Freidel squats in the opening of a looter's tunnel that has been gouged into the base of the main shrine in the center of Waka. "The looters started this tunnel thinking they were going to perhaps find a tomb, and then they stopped," Freidel says. "They gave up fairly soon in the game." The culprit who stole the stela that is now on exhibit in Fort Worth is thought to be a Mexican logger who sawed off the carvings and hauled them out on muleback. That was back in the 1960s, when an oil company put the first road in. The Harvard archaeologist who first excavated here in the early 1970s tracked stolen stelae to private collections and museums in the United States and Europe. In a clearing amid trees festooned with vines and epiphytes, Freidel stands over an assemblage of smooth-faced stones that appears to have been one massive stela, sawed into sections. The Maya erected stelae like huge gravestones on the forest floor. 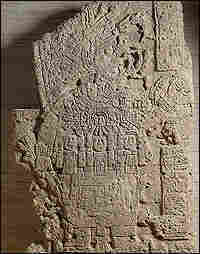 "This is the carcass of the stela that's in Fort Worth: K'inich B'ahlam," or Sun-Faced Jaguar, Freidel said. "And over there is the carcass of stela 34 ... his wife, Lady Kah-bel." Freidel said he is excited that the Kimbell Art Museum has agreed to pay for a precise replica of the sun-faced jaguar that will be erected here on-site. His queen, stela 34, currently resides in the Cleveland Museum of Art, which, according to a spokesperson, has no such plans. Both stelae are legally owned by the museums because they were taken before 1970, the year of the first international treaty prohibiting the trade in stolen antiquities. "This is the irony: That in place of them keeping the replica and us getting the original, now they are giving a replica to the poor Guatemalans, when it shouldn't be that way," Lopez Aguilar says. For Lopez Aguilar — an archaeologist and a native petenero — the legacy of the looters has been horrific. Some sites, such as the ancient city of El Naranjo, have been destroyed by rapacious treasure hunters. He estimates that nearly every one of the roughly 1,000 important Mayan sites in the Petén has been looted. "If we don't increase our level of vigilance, if we don't pass stronger laws, our country will continue to be at the mercy of those looters, and our grandsons will be condemned to go to the United States to know their history," Lopez Aguilar says. Today, Guatemalan schoolchildren can visit the National Museum of Archaeology in Guatemala City, and see room after room filled with the artistry of the ancient Maya. But many masterpiece carvings, masks and vessels that Guatemalans believe should be in their national museum are not. They reside in collections around the world — evidence of 40 years of unrestrained pillaging.